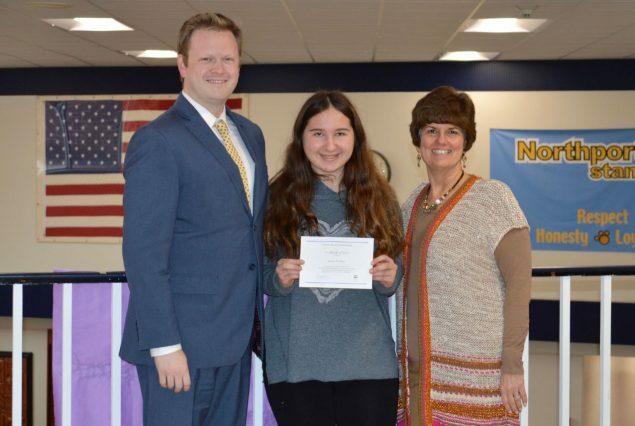 Northport High School senior Julianne Starzee, named a National Merit Semifinalist last fall, was recently named a finalist in the program. This prestigious program honors the nation’s scholastic champions and encourages the pursuit of excellence in academics. Of these finalists, Starzee will be competing with approximately 15,000 students nationwide for one of 2,500 (National Merit Scholarships. Notification of National Merit Scholarship recipients will be released between April and July of 2018. Photo: Northport High School senior Julianne Starzee was recently named a finalist in the National Merit Scholarship Program.